Since this country’s founding in the early 20th century, the packs of untamed horses that roam freely through our beautiful and hostile alpine landscape have captured the public’s imagination. The savage grace and freedom of the horses — known here as brumbies — have made them into a popular symbol of the national spirit. Today, environmentalists want the brumbies shot. Not since cattle roamed the mountain parks (before a ban in the 1950s) have animals done such damage to the alpine regions that Australians proudly call the “high country.” A 2014 survey estimated there were more than 9,500 wild horses in the Australian Alps. Some of the horses descend from animals that belonged to settlers in the early 1,800s. The brumbies eat fragile alpine moss. Their hoofs trample the banks of creeks, killing vegetation that stops silt from building up. They destroy peat that takes thousands of years to develop. Campers report the fear of being trampled by herds in the middle of the night. Populations of rare alpine water skinks and broad-toothed rats are declining as the brumbies degrade their habitats. Three endangered species — the corroboree frog, the mountain pygmy possum and the stocky galaxias, a fish found in only one river system — are at risk unless the number of horses is reduced quickly, scientists say. The environment is being sacrificed for a national myth. The cultural bias for brumbies has helped the tourism industry — reinforced by anti-scientific sentiment among rural communities — to successfully lobby government officials to end an annual culling of the horses. The animals are now a protected species. And the government of New South Wales State enacted a law last year ending a program that had aimed to gradually reduce the brumby numbers over the long term in the Alps’ largest reserve, the Kosciuszko National Park. Misguided military lore increased the horses’ mystique. During World War I, Australian mounted units called the Light Horse Brigades served with distinction in Gallipoli and Beersheba in the Sinai Desert, where they carried out a famous charge at entrenched Turkish soldiers over open ground. Some of the Light Horse soldiers came from the high country. Many Australians believe that brumbies made an important contribution to the horse regiments. Among them is the deputy premier of New South Wales, John Barilaro, the politician responsible for shielding them today. 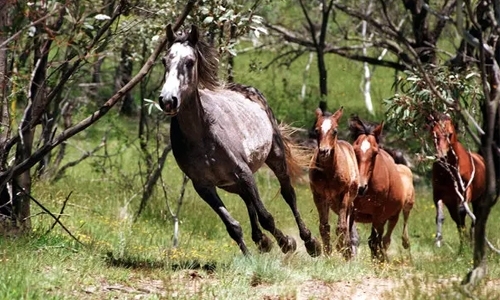 “Nothing is more synonymous with the Australian outdoor lifestyle than the brumby,” Barilaro told the legislature when he introduced a pro-brumby law. The war story doesn’t stand up. The Australian army preferred Walers, a sturdy breed that could travel long distances in hot climates with little water, and a study for the New South Wales National Parks Service found no evidence that brumbies were ever used by the army. In alpine national parks, even a small number of horses can cause severe damage because the sensitive environment recovers very slowly. The legend of the bush battler resisting state authority has become a central and often-irresistible rationale for the protection of rural interests at the expense of scientific and political progress. Australians’ attachment to rural legends is exploited by local politicians to deliver their communities’ wish lists — from counterproductive subsidies for farmers who haven’t prepared for drought to the construction of an inland railway line of dubious value. Opposition to culling is also driven by a hostility among local communities towards environmentalists and government conservationists. A leading proponent of the new state law is a former conservative politician who now makes a living organising horse rides in the park. The horse advocates’ success has emboldened activists across the border in Victoria State, where in December a judge was asked to stop the government from removing wild horses from the Bogong High Plains section of the Alpine National Park. A decision is expected this year. To apply political pressure, dozens of scientists published an open letter in November arguing that the decision gave priority to a single invasive species over many native species and ecosystems, some of which are found nowhere else on Earth. These scientists advocate shooting horses from helicopters right away (large parts of the park are inaccessible by vehicle). Barilaro, the politician, says Australians’ “social conscience” won’t accept shooting, and they should be moved to less-vulnerable areas of the reserve. Safeguarding a nation’s cultural heritage is as important as protecting its environmental heritage. But a fantasy, however appealing, should not be allowed to outweigh good science.